Augmented reality hit the world by storm with the arrival of the Pokemon Go! app, but now virtual reality is here! Libraries can capitalize on this newer technology to bring fun as well as educational experiences to all library users. Ages 7 to 100 welcome! Virtual reality equipment and accompanying software like the Occulus Rift are pricey, but the Google Cardboard glasses are a bargain ringing in under $20 for a headset made of cardboard and lenses. Google recommends ages seven years and older. Note: Directors who attended the 2017 WVLS Director’s Retreat left with a free pair! Want to borrow a few? Email Anne Hamland at ahamland@wvls.org or call 715-839-5082 ext. 150. Users download the free Cardboard app on their smartphone, open the app, scan a QR code on the side of the headset, put their phone in the device, lift the headset to their eyes and their off! The Cardboard app comes with free introductory content as well as a link to the YouTube virtual reality channel. Many content resources are out there for the public and educational systems to take advantage of for free! Viewers can view artifacts, visit far off places, and witness new cultures. The Wisconsin capitol recently released a virtual tour of the capitol building. 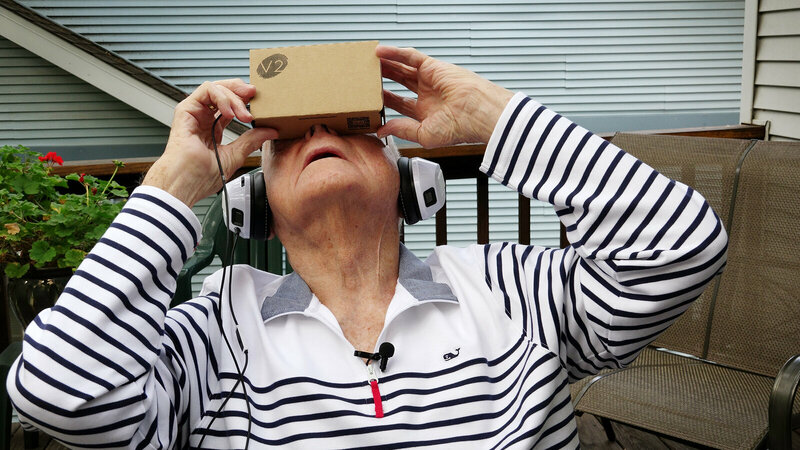 Some libraries are Bringing Virtual Reality to Our Senior Patrons. Ages seven (recommended) and up can use this technology. If you keep safety in mind and use assistants to guide users or perhaps a swivel chair, this technology can be inclusive for most physical abilities and technological skill levels. Check out this article from the National Public Radio: Affordable Virtual Reality Opens New Worlds for People with Disabilities. Augmented reality incorporates digital content into the real world via a smartphone’s camera. Viewers open up an augmented reality app on their phone and hold up their camera to their surroundings to reveal digital content incorporated into their surroundings. Pokemon GO! app: Players walk around in the real world to find Pokemon characters, leveling up the more characters they find, and build a team to battle in a gym against other players. Why Pokemon Go! and The Library is a perfect partnership. Mythical Maze app: Used by libraries in the United Kingdom for the 2014 summer reading challenge. Children downloaded the app and located mythical creatures hidden throughout their library. Mini-games were “unlocked” when children found creatures.